I was honored to be included in a holiday cookie contest with some incredible blogger friends of mine. We each gave a dozen of our favorite holiday cookies to 1 lucky winner! 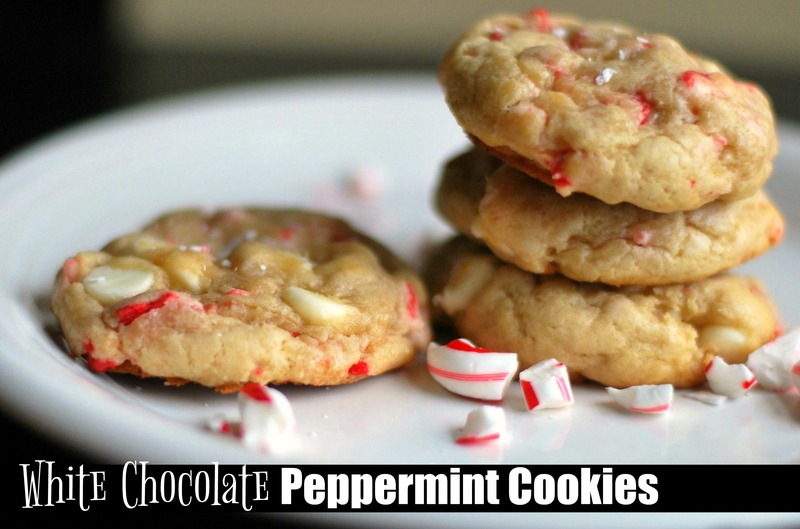 We have tried many, many white chocolate peppermint cookie recipes and these are our all time favorite. So, I knew immediately which cookies I was going to choose to bake for the contest. I am baking some more of them tomorrow for my husband to take to work for his company Christmas party, #obsessed. Click here for more of our favorite Classic Christmas Treats! Preheat oven to 375 degrees F. Spray cookie sheet with pam. In the bowl of a stand mixer fitted with a paddle attachment, or in a bowl with a hand-held mixer, beat together the butter, cream cheese, brown sugar, and sugar until creamy, about 3 minutes, scraping down the bowl as needed. Add the eggs one at a time, mixing after each, followed by the vanilla and peppermint extract. In a separate bowl, combine the flour, baking soda and salt. Add to the mixer and mix on low speed just until incorporated. Mix in the white chocolate chips and peppermint chips. Roll cookie dough into rounded tablespoons and place on the pam sprayed cookie sheet about 2 inches apart. Sprinkle with coarse sugar, if using. Bake until edges just begin to turn golden, about 9-11 minutes. Let cool on the sheet pan 5 minutes, then transfer to a wire rack to cool completely. These look INCREDIBLE! Outstanding job with this recipe! These are so pretty. I bet they just are so delicious! I’m getting hungry just looking at them! Love!